AAAI-10 was a Smashing Success! The Twenty-Fourth AAAI Conference on Artificial Intelligence was held at the Westin Peachtree Plaza in Atlanta, Georgia, USA, July 11–15, 2010. 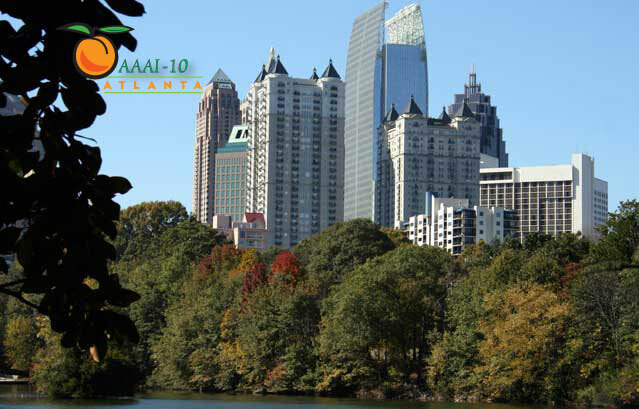 The purpose of the AAAI-10 conference is to promote research in AI and scientific exchange among AI researchers, practitioners, scientists, and engineers in related disciplines. On this page, you will find links to the wide variety of programs that were held at AAAI-10. Selected lectures and programs from this conference have been posted at VideoLectures.Net. Invited Talk Videos Now Available! Videos of the invited talks from AAAI-10 and IAAI-10, along with accompanying slides, are now available at Videolectures.net. In addition, you can view the AAAI-10 AI Video Competition accepted videos. AAAI-10 featured an exciting slate of invited speakers, including keynote Leslie Pack Kaelbling (from the Massachusetts Institute of Technology), Carla P. Gomes (from Cornell University), Barry O'Sullivan (from University College Cork), David C. Parkes (from Harvard University), and Michael Thielscher (from the University of New South Wales). Details on these and the exciting slate of IAAI speakers too!